When we travel, I like to do a little research ahead of time to find a good place to stop and eat lunch. We almost always stay away from chain restaurants because we like to find the best local food, especially when visiting places we don’t travel to very often. Since the last time we traveled we were just playing it by ear, depending on how far we drove, we decided to stop once we got hungry. California Pizza Kitchen (CPK) was literally the first place that we found. We had been to CPK at least once before, but it really wasn’t anything memorable. On this visit, I noticed that their menu had quite a few new items, with many smaller, lighter dishes, which I always enjoy for lunch. Brad ended up choosing the pizza we shared, and as soon as I took a bite, I knew I had to recreate it at home. I couldn’t believe that I had never thought of layering these ingredients on a pizza. 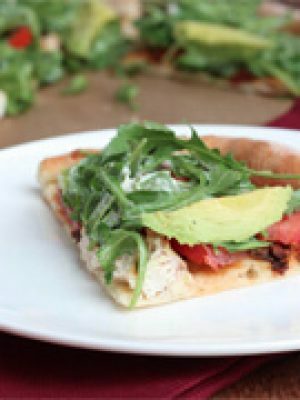 This California club pizza is filled with protein and veggies, but is still relatively light and fresh. 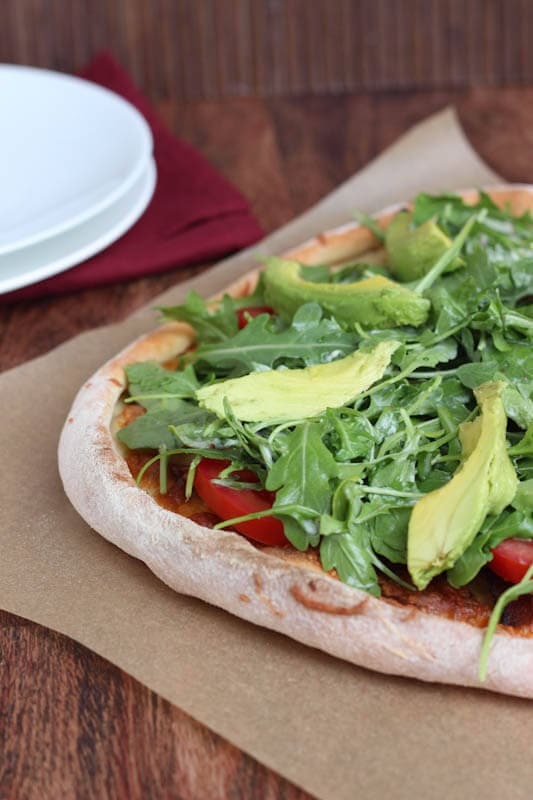 The things that I love most about this pizza are the fresh tomatoes, arugula and avocado that are piled on top of the cooked pizza. 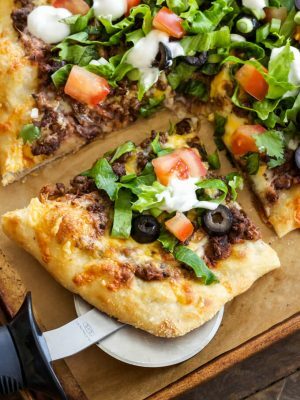 So if you are looking for a new pizza recipe, or just want to recreate your favorite CPK pizza, you must try this California club pizza recipe. 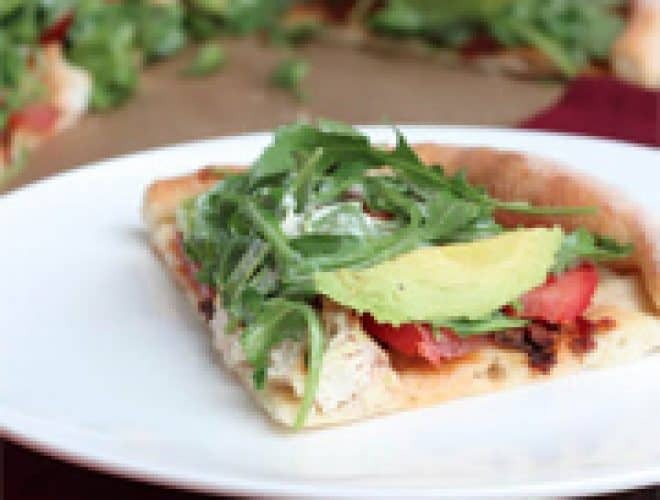 Try this homemade copycat of California Pizza Kitchen's California Club Pizza! Heat the oven to 425 degrees and preheat a pizza stone. Roll the pizza dough into a 12 to 14 inch round. Spread the olive oil in a thin layer on to the dough. Layer the chicken, bacon and mozzarella cheese over the entire pizza. Bake until the cheese is melted and the crust is lightly browned, about 10 to 12 minutes. Remove from the oven. While the pizza is cooking, mix the arugula and mayonnaise together in a small bowl. 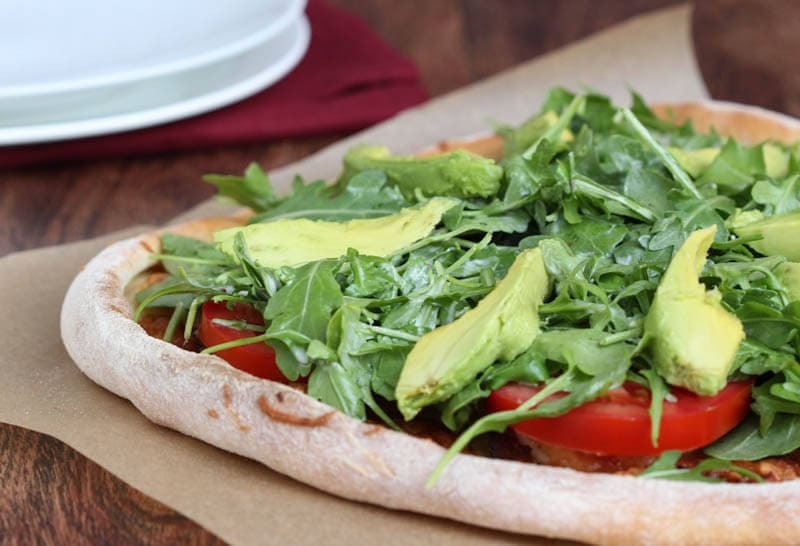 Layer the tomato, arugula mixture and avocado over the cooked pizza. Note about pizza dough: I like my pizza crust very thin. I generally use half of a standard size ball of pizza dough. Would this work on a grill/BBQ as well? Ashley, this pizza looks amazing! So fresh and light! What a perfect lunch or dinner. I found you over at Show Stopper Saturday, I can't wait to try this! Pinning now to my dinner ideas board. Thanks! Thanks for stopping by and sharing, Jen! Hehe Tim and I got our hands on some wonderful pizza dough and headed over to the CPK website for some much needed inspiration as well ;). I love topping cooked pizza with fresh ingredients! Looks great, Ashley, as always! Is it Friday yet? Gorgeous looking pizza! Love how colorful and fresh it looks! 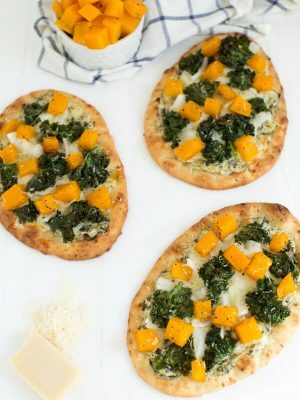 Will definitely have to try making this on our next pizza night, thanks for sharing Ashley :) Pinning! Beautiful pizza, love how fresh you made it look! And it tastes as fresh as it looks! This is one of my favorite pizzas at California Pizza Kitchen! I try to stay away from chain restaurants too, but I love me some California Pizza Kitchen. 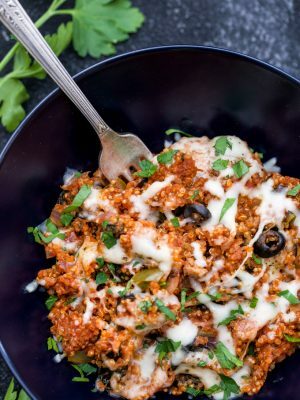 Only I can never decide between pizza or a salad because their salads are some of my favorites! I agree! We also ordered one of the small salads with asparagus, arugula and sun dried tomatoes and it was incredibly delicious. 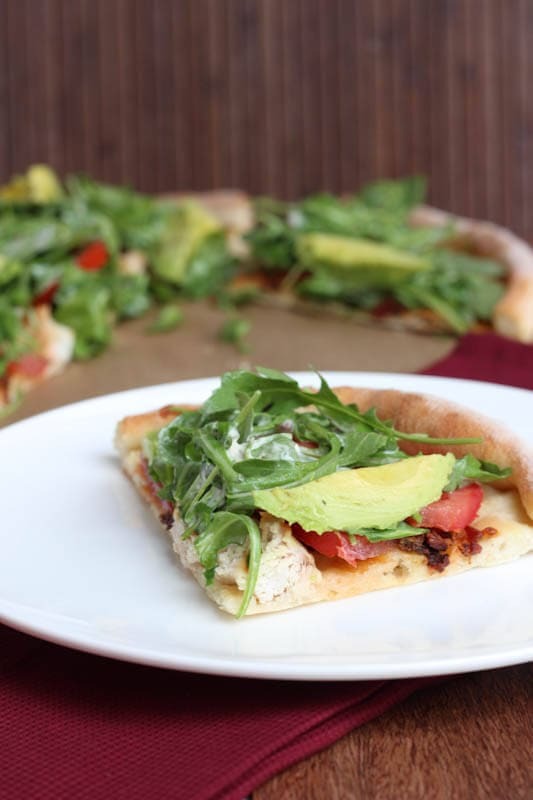 Thanks Consuelo, definitely add it to your next pizza night! I'm a huge fan of club sandwiches (one of my go-to dishes whenever we eat at a diner), but I've never thought to put it on a pizza, either. This looks like a fresh, delicious dinner! This looks so good! Perfect for a light dinner. Yes, and it is relatively quick and easy! Pizza looks delish. There can never be enough wonderful ways to create a pizza! I agree, Melanie! I love how many different combinations of ingredients can be added to a pizza.